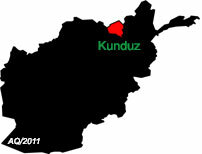 KUNDUZ, Afghanistan, July 22 (Xinhua) — Up to three dozens of people, including 30 Taliban fighters, have been killed over the past two days as fierce fighting has been continuing for the control of Qala-e-Zal district along the border with Tajikistan in the northern Kunduz province, officials said Friday. In the latest blow inflicted to the Taliban, 18 insurgents were killed on Friday as government troops pounded Taliban positions, an army official Brigadier Mangal Rahat said. According to the official, six more Taliban fighters had been killed on Thursday as their battle tank was destroyed in air strike. Six more militants had also been killed on the same day Thursday in the neighboring Dasht-e-Archi district, the security official asserted. Taliban militants who had briefly captured Kunduz provincial capital the Kunduz city in last September have intensified activities in Qala-e-Zal, Dasht-e-Archi and Khawja Ghar district since Sunday and so far, according to some villages. Taliban purported spokesman Zabihullah Majahid in contact with media has claimed taking large swathe areas in Qala-e-Zal and Khawja Ghar districts. However, Kunduz police chief Mohammad Qasim Jangalbagh refuted Taliban’s claim, saying the Taliban offensive has been repulsed. He also stressed that reinforcement reached to Qala-e-Zal district Thursday night, forcing militants to flee. Meanwhile, locals in talks with Xinhua said that clash for the control of Qala-eZal district is continuing. The ongoing fighting in Qala-e-Zal district has forced hundreds of people to leave their homes for safer places. “More than 200 families have already left their homes for safer places,” an elder from Qala-e-Zal, Hajji Mohammad Hassan told Xinhua. Hajji Hasan also confirmed that the government forces were able to repulse Taliban offensive in Qala-e-Zal and retook the district headquarters in Aqtapa area on Thursday. Meantime, a local analyst Mohammad Rafiq Kakar in talks with local media warned that overlooking the fragility of the situation in Qala-e-Zal and adjoining districts by government would enable enemies to destabilize more areas.